Originally released in 1993, "Secret of Mana" is by far the most popular title in the "Mana" series. Now it's finally getting a long-awaited, full 3D remake! The game faithfully retells the beloved story while adopting modern 3D graphics and controls. It features a newly arranged musical score and voiced characters. 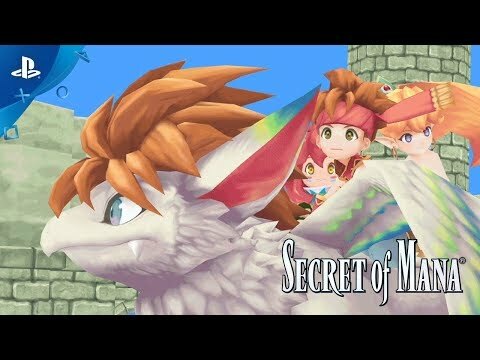 The adventure of Randi, Primm, and Popoi is reborn in the new "Secret of Mana"! Long ago...the world prospered and humanity thrived thanks to a power known as Mana. However, humans soon sought to use Mana to create the ultimate weapon—a floating battleship called the Mana Fortress. This greedy arrogance angered the gods, who in turn unleashed vicious beasts into the world. A violent war between the Mana beasts and the fortress engulfed the world in poison and fire until Mana had all but disappeared. In humanity's bleakest hour, a hero wielding the Mana Sword appeared and destroyed the fortress. The world was left in shambles, and yet humanity persevered and there was peace throughout the land. The game faithfully retells the beloved story while adopting modern 3D graphics and controls. It features a newly arranged musical score and voiced characters. Originally released in 1993, "Secret of Mana" is by far the most popular title in the "Mana" series. Now it's finally getting a long-awaited, full 3D remake! The memorable adventure of Randi, Primm, and Popoi is reborn in the new "Secret of Mana"! © 1993,2017 SQUARE ENIX CO., LTD. All Rights Reserved. SECRET OF MANA is a registered trademark or trademark of Square Enix Co., Ltd. SQUARE ENIX and the SQUARE ENIX logo are registered trademarks or trademarks of Square Enix Holdings Co., Ltd. The “PS” family logo, “PS4”, and “PSVITA” are trademarks or registered trademarks of Sony Interactive Entertainment Inc. The ratings icon is a registered trademark of the Entertainment Software Association. All other trademarks are property of their respective owners.